Posted on July 24, 2018 July 24, 2018 by Margaret & filed under Food, New York Stories, Reviews, Travel. There’s nothing quite like visiting neighborhoods that were old stomping grounds before I moved out to the ‘burbs to start a family. A couple of years ago, I became a personal tour guide for my new husband, an Englishman. I’ll never forget exiting the West 4th subway station in Greenwich Village. The basketball courts were still there, lively as ever. But as I walked the streets, so much had changed. I felt sad that some of my favorite places, frequented in the 1980s with college friends, no longer existed. But I had a guy on my arm who was up for adventure, and there was something exciting about making new discoveries together. Last week, we continued our adventure in the East Village. I didn’t hang out there often in the 1980s, but I could occasionally be found enjoying a vegetarian meal and a philosophical discussion with a college friend at Life Café. Snapshots flash in my memory of Alphabet City crime, the homeless, the Tompkins Square Park riot, artists, punk rockers, and clubs like CBGB, The Knitting Factory, and the Pyramid Club. The neighborhood was edgy back then. Times have changed. As a waiter commented, gentrification has exchanged the art and music scene of the 80s for “finance bros, NYU students, and a Target.” Reminding myself that each new generation brings about changes that make the older generation swoon, we set out to find some gems in today’s East Village. And we did! We took the L train to 1st Avenue and walked east on 14th Street. Unable to pass a church without attempting to get past the often locked doors, we gave it a try at the Church of the Immaculate Conception. Miraculously (pun possibly intended), it was unlocked and did not disappoint. John Hughes, the fourth bishop and first archbishop of New York, founded the church in 1855, six months after a trip to Rome during which Pope Pius IX promulgated the doctrine of the Immaculate Conception. Hughes resolved to erect a church to commemorate the event. After gazing at stained glass windows and sharing some Catholic trivia with the hubby—including how the Immaculate Conception has nothing to do with how Jesus was conceived, despite popular misconception (no pun, I swear)—we walked past Stuyvestant Town-Peter Cooper Village on 14th Street, made a right on Avenue A, and decided to weave up and down the streets to get a feel for the neighborhood. It wasn’t long before my witchy senses began tingling from the number of metaphysical and crystal shops. At Crystals Garden (247 E. 10th), we walked through a jungle of plants for sale outside the shop into a room filled with beautiful crystals, gem stones, jewelry, and dream catchers. Around the corner, we found two more shops. Flower Power (406 E. 9th) sells dried herbs and extracts, and Enchantments (424 E. 9th) is an occult-themed shop offering custom-carved candles, incense, and books. In case you’re not in the mood for ice cream, Butter Lane Cupcakes (123 E. 7th) is next door. Pick your favorite cake flavor and icing. I had to draw the line somewhere, so we’ll try the cupcakes on our next visit. Ditto with gelato from Gelarto (145 Avenue A), but we did sample the mixed berry (fruits of the forest) sorbet and the chestnut gelato and they were both yummy. We rounded 1st Avenue again and walked east on E. 6th Street. As a nature girl, this was my favorite block. But before we get to the flora and fauna, there are two bars that looked interesting. Death & Company (433 E. 6th) wasn’t open at the time we passed by. However, the description “bartenders in bow ties and suspenders recall the speakeasy era at this dark, moody cocktail lounge” had me make a note for future reference. We did pop in to Amor y Amargo (443 E. 6th), an “intimate bar offering an extensive list of cocktails that showcase classic Italian and craft bitters.” I bought a bottle of bitters there to recreate a favorite cocktail we enjoyed in New Orleans a few weeks ago. The bartender recommended an Indian spice shop called Dual Specialty (91 1st Avenue) to find the rose water I also needed for the cocktail. They had a wide selection of herbs, groceries, and spices and I picked up some sumac, too. Yum. Now, back to the flora and fauna. East 6th Street boasts not one, not two, but three community gardens that are magnificent. 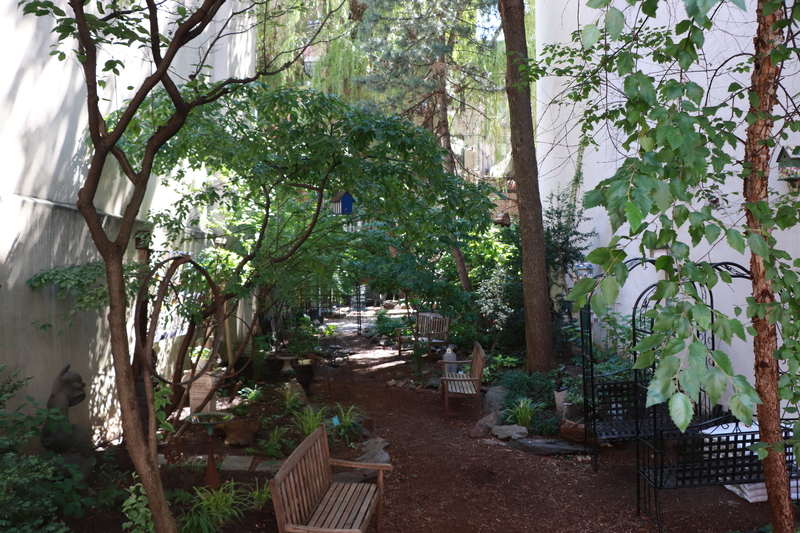 Walking east on East 6th from 1st Avenue, the first one you hit is The Creative Little Garden, a sliver of joy sandwiched between two buildings. I sat on the bench swing and enjoyed a bit of contemplation as my husband put his camera to use. 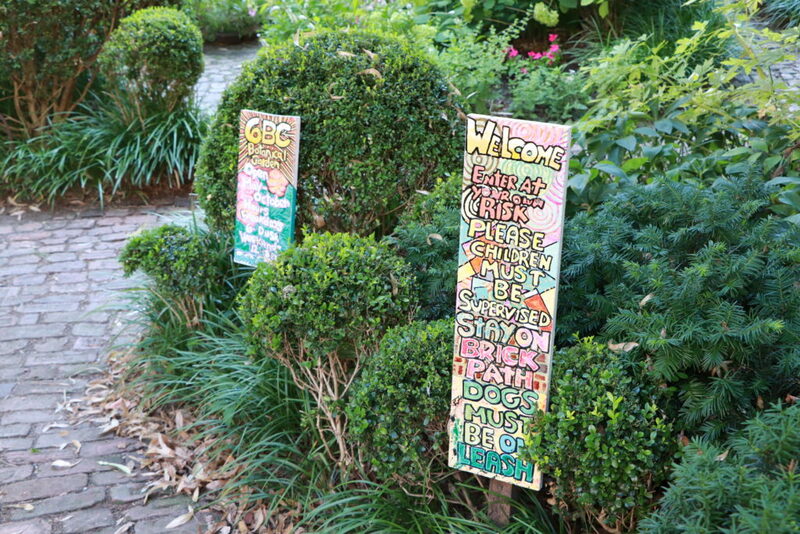 A few steps down the street, we arrived at Sixth Street and Avenue B Community Garden. 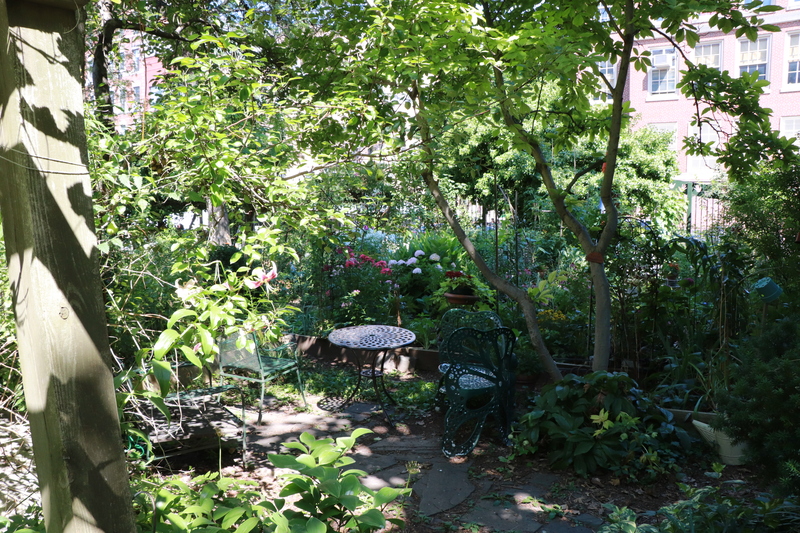 Tables, chairs, a stage for intimate performances, a turtle pond, extensive vegetable and herb gardens, flowers, trees—what more could I ask for? But wait, there’s more. Just across Avenue B and halfway down the block is 6BC Botanical Garden. Weaving through the garden paths, we found several cozy hideaways to sit and have a quiet chat, unseen by passersby. There’s also a “tree house” of sorts, a two-story, tiny house. Up to four people can climb to the second floor and sit looking out at the garden. Charming. If larger parks are more your thing, Tompkins Square Park between Avenues A and B and E. 7th and 10th Streets has lawns to sunbathe, benches, and multi-purpose courts to play ball. All of this exploring works up an appetite and there is no shortage of restaurants in the East Village. Just Google and read reviews and you’ll find something to please your taste buds. We decided on Westville East (173 Avenue A), a restaurant that has several locations throughout the City. I was in the mood for their market plate special, a choice of four veggies from their extensive list. I chose roasted artichokes with parmesan, Brussels sprouts with honey Dijon, green peas with bacon, and mixed mushrooms with leeks and herbs. My husband had the beer-battered fish and chips, which he enjoyed even if they weren’t in the English style. We planned on circling back to Death & Company for a drink before heading home, but decided on cappuccino instead at Elsewhere Espresso (335 E. 6th). Hubby said it was a good one, but the place is tiny and the few tables they had were taken, so we didn’t linger. As I was writing this post, I discovered so many other places I wish we had visited. First Street Green Cultural Park, Marble Cemetery, more than a dozen other churches, Nuyorican Poets Café, Please Don’t Tell Speakeasy (with secret entrance), Russian & Turkish Baths, Blind Barber (a barber shop by day and backroom bar by night), and too many restaurants to name featuring cuisine from over a dozen cultures. Next time. This excursion was more of a “learn as I go” one. Glad you enjoyed it. So much more to NYC than the usuals. So cool. I love finding something unexpected. Those gardens were so serene. Will have to follow your tour. I seem to get confused as to where to go in the Village since we hardly get there any more. Thanks for making it so appealing. Thanks! Spontaneity and a bit of Google maps go a long way. Wonderful, it took me past old haunts from childhood and some I never knew!